There were only two titles that seemed to universally impress the GamesFirst E3 crew coming out of 2005: Prey and Alan Wake. We now know that Prey is nestled safely in the publishing folds of 2K Interactive, but Alan Wake is still exposed to the elements, waiting for a publisher to come forward. Original release lists had Alan Wake scheduled for release on the Xbox 360 at the beginning of this month. The question is, where is Alan Wake? It\'s a question that\'s not going to be answered by Alan Wake\'s developer, Remedy. The development house is being closed mouthed about the project, admitting only that they are, \"...doing well and weathering the cold winter with good humor.\" They say nothing at all about Alan Wake. Remedy, it appears, is hard at work in the middle of a media blackout. After an initial strong showing at E3 2005, Alan Wake virtually disappeared from the public eye. Easily considered one of the most interesting titles of the show, the artistically rendered suspense and horror title caught the public attention with beautiful graphics and a meticulously detailed small-town environment, even when no gameplay was seen. The story focuses around a horror writer who begins experiencing the realities behind his books while in the process of trying to find his fiancee. Suddenly, what was a pleasant, rural town turns into the slithery things straight from the nightmares that served him so well in storytelling. While details on the storyline are shadowy after that point, Alan Wake promises to combine action and suspense with a crumbling version of the rural heartland. Without revealing much of the game beyond some spectacular transitions between day and night environments (an element that\'s evidently going to be key to the game\'s story), Remedy has managed to peak the interest of the entire gaming community. And all of this without showing a single frame of actual gameplay. We know almost nothing about how the gamer will actually interact with these environments. All we really know is that we\'ve seen some visually impressive images, some pretty music, and that it comes from the same minds that brought us Max Payne. Max Payne was famous for its action, bullet time, and over-the-top dialog. How much can we expect to translate to Alan Wake (besides a propensity to name games after their main characters, obviously)? For a game that no one has really seen or played, with no idea of when to expect it, Alan Wake might be one of the most highly anticipated mythical games of last year. Hopefully that will change by E3 2006, when we can only hope to see more of Alan Wake in action. 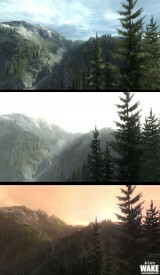 In the mean time, be sure to check out the screenshots below, and the latest Alan Wake trailer found on http://www.alanwake.com.